Investigators charged the lone surviving gunman from the Mumbai attacks with 12 crimes on Wednesday, including murder and waging war against India. 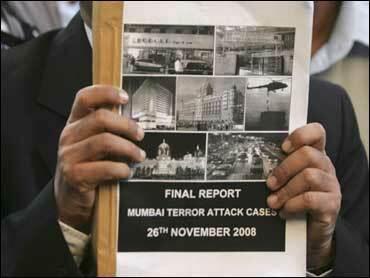 The charges - which are detailed in a document more than 10,000 pages long - also included Kasab's confession, accounts from 150 witnesses and closed circuit television footage that shows him and his accomplice walking into Mumbai's crowded Chhatrapati Shivaji train station and spraying it with bullets, Mumbai police's main investigator Rakesh Maria had said earlier. Kasab has been given a copy of the police charge sheet, Nikam said Wednesday. He also said that at least 35 other suspects in the attacks had "absconded" and authorities would continue investigating. He declined to list their names or nationalities. If convicted on the two most critical charges - murder and waging war against India - the 21-year-old Kasab will likely face the death penalty.